Find artworks, auction results, sale prices and pictures of Andrew Maccallum at auctions worldwide. T. E. Walker Dec.; Christie's, London, 2 June 1888, lot 13 (33.12.0 to Berkeley). R.O. Hambro, Esq. dec.; Christie's, London, 27 October 1961, lot 66 (15.15.0 to Lawson). MACCALLUM, Andrew. A collection of Photographs from some of the Works. London: H.B. Franklin, . 2° (550 x 407mm). Portrait and 24 photographs mounted on card. Original half morocco, spine gilt (a little rubbed). ROBERT HOE'S COPY with his small leather armorial bookplate and a presentation inscription to him from the author on the title. One of only a few copies printed: 'For Private Circulation only'. Only the rear board is attached to the text block. Sold not subject to return. The Egyptian pyramides Keops, Kefrens and Mykerinos at Giza with the Nile, the landscape with buildings, figures, palms and birds. Signed. Dated 1873. Oil on relined canvas. 91.5 x 133 cm. 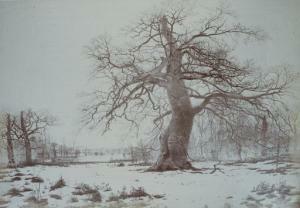 The landscape painter Andrew McCallum studied art in Nottingham and Manchester. 1852 he went to London thereafter he made several journeys to Italy, among other countries. 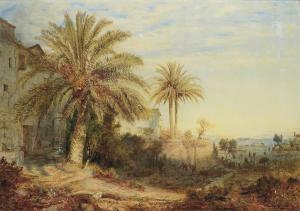 He visited Egypt, where he together with the friend Lord Paget investigated places along the beaches of the Nile. 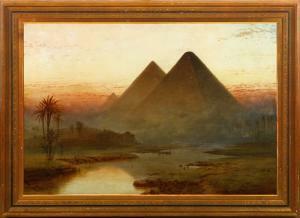 It´s likely at this occasion McCallum painted the pyramides of Giza. 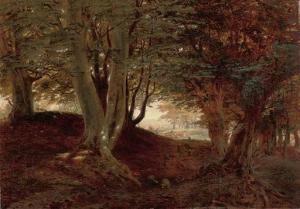 Otherwise he is famous for his paintings of forrest landscapes. Note - Crackles and peelings. Retouches.